Adam D. Leaché and Matthew K. Fujita used new DNA analysis techniques to determine that a species of West African rainforest gecko is very likely to be at least four distinct species. West African geckos have been seen for years, but they look so alike it was assumed they were the same species. He and Fujita wanted to learn about the history of a belt of African rainforest that is 3,000 miles long. So they decided to sample the genes of various geckos in the vast region, to discover more about the habitat. What they found from identifying genetic differences among the 50 geckos collected from ten different forest patches, was that the genetic differences were matched to the different types of rainforest habitats. Rainforest gecko habitats over long periods of time had been disconnected from one another. The tiny differences in the geckos were thought to have emerged due to the variation in their habitats. The different species of geckos (which all look nearly identical) are now thought to have evolved over 100,000 years ago as their habitats became fragmented. Leache has undertaken five expeditions to the African rainforests since 2003. He has been surveying reptiles and amphibians there. The work is difficult with a lot of hiking to isolated areas. Fujita used tissue samples to analyze the cells of the geckos. 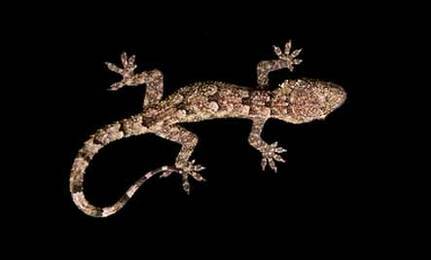 Five genes from the nucleus and one from the mitochondria were used for each gecko. Their statistical analysis reportedly produces a nearly 100 percent chance there are four or more gecko species, rather than the just one. Their work shows biodiversity is both more abundant, and more subtle in that rainforest than previously known.